There’s nothing quite like date night, where the two of you can get together and spend some well-needed time with one another. Sometimes though, dates can get a bit samey and it can be hard to find something unique to do without breaking the bank, regardless of where you are in the world. Whether you’re living in Rome, London, Paris or New York, there’s a perfect date out there for everyone and who knows, it could be the date that takes your relationship to the next level! Together with Angelic Diamonds, retailers of bespoke seven stone rings, I’m sharing date ideas from around the world so that you can make the most of your time together, wherever you are! Let’s start with the UK. London is a booming metropolis, full of great shops, bars and restaurants that’ll keep you entertained for more than just one date… if you’re lucky! I love visiting London but I tend to be there for work, making my time limited. I’ve experienced lots of things to do that would make great date ideas though such as the Alice in Wonderland themed afternoon tea at the Sanderson Hotel which would set you back around £50 a head. For a date thats even more purse friendly, the Natural History Museum, National Portrait Gallery and the Tate Modern are great options because they’re all free to enter and will provide hours of entertainment, soaking up the culture. Westminster Bridge with Big Ben nearby and the Houses of Parliament aren’t too far away either and since they’re close to the Southbank, you can grab some tasty street food while you’re there too. As the capital of Italy, Rome is brimming with 3000 years of art, architecture and culture; making any date in this beautiful city one of true romance and sophistication. If you’re sporty, an A.S. Roma football match at the grand Stadio Olimpico would be an exciting date. A ticket will set you back €100 (roughly £88) but if that’s out of your budget then there’s still plenty to do in the capital that will be more memorable than going to the cinema! The Trevi Fountain is so picturesque that it’ll have you mesmerised and you can even through a spare penny in to wish you good luck on your date. Once you’re done, you can take a stroll to one of the many cafes for coffee and people watching! Paris has to be the true city of romance. Tourists come from far and wife to have a great time with their partner; I even have a friend whose boyfriend took her to Paris for the day on the Eurostar from London! Since it is home to many of the world’s greatest writers and artists, Paris oozes chic everywhere you walk through its many streets. If you’d like to take your date to new heights then the Eiffel Tower is an impressive feat any day of the year. Why not book in at 58 Tour Eiffel while you’re there too? This restaurant has a fantastic menu, including a cute picnic lunch and has amazing views over the incredible city. There are plenty of affordable options in Paris too. It is home to some of the most beautiful bridges in the world so my top pick for a unique yet affordable date would be to head to the Pont des Arts Bridge where many lovers write their names on padlocks and attach them to the bridge. If you can make it on a date here, you can make it anywhere… The big apple offers something for everyone with the theatres of Broadway, the neon-lit Times Square and skyscrapers like the Empire State Building. For the ultimate unique date, a private helicopter ride would be absolutely incredible. You’ll need to get saving though as a date seeing New York’s famous landmarks in this way will set you back well over £1000 but with unparalleled views of the Empire State Building, the Statue of Liberty and Central Park, it’ll be worth every penny. However New York offers plenty of unique yet affordable date options too. Take a twilight walk around Central Park like Audrey Hepburn did in Breakfast at Tiffany’s before heading to one of Manhattans cool rooftop bars or head to the restaurant that was featured in When Harry Met Sally; if you’re a movie buff I’m sure you’ll be quoting lines from the film in no time! If that’s not enough, you could take your date on a walk through the financial district to feel part of the glamour and excitement of the Wolf of Wall Street. Just be careful, its a jungle out there…! Once you’ve chosen your date, you’ll need an outfit. Now I don’t claim to be overly clued up on mens fashion but ladies, I’ve got you covered. Praslin have just launched their UK website and its packed full of gorgeous outfits that would be perfect to wear on a date day or night. 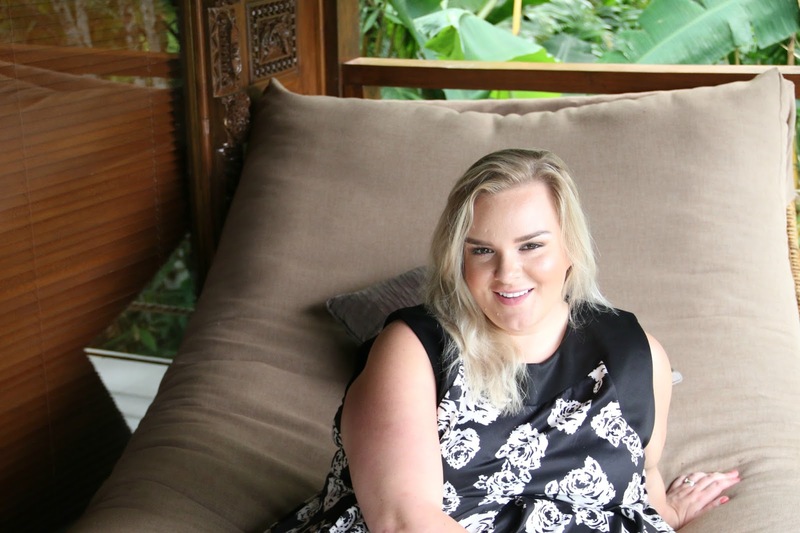 The monochrome floral dress that I’m wearing in these photographs at the Alassari Plantation in Bali is from their plus size line which will soon be added to their website. For now, you can shop Praslin online at Yours Clothing and ASOS. I’d definitely recommend checking them out if gorgeous evening dresses and floral prints are your thing. Feminine, glam and cut to flatter, you’ll be sure to find something to wear on your next date! Where would your dream unique date be? What do you think of this gorgeous dress? Previous Post How To Make Your Life More Ribenary with the Ribena Doodle Your World App! Another great place for a date in London is Piccadilly circus. Lots of Ice cream bars and desserts and then there is the big arcade too! Lots of fun! Im not sure on my ideal date. Definetly fun over romance though. What some fantastic sounding places to head for a date, I am in love with that dress as well it is so beautiful. There are loads of gorgeous places for dates in London. Afternoon tea is a great idea for a date I love those. There are so many to choose from. Love the dress! As to the date, my hubby took me to The National Galery to show me work his grampa did as an art restorer… it was a perfect date, one I will never forget.